Continuing MissingRemote’s tradition of providing you guys the patches necessary to enable Concurrent Sessions, we’ve created a new thread for Windows 7 Service Pack 1. The process below has been confirmed working with the Beta versions of Windows7 Ultimate, Professional, Home Premium and Enterprise Editions, x86 & X64 build 7601, Service Pack Build 178. 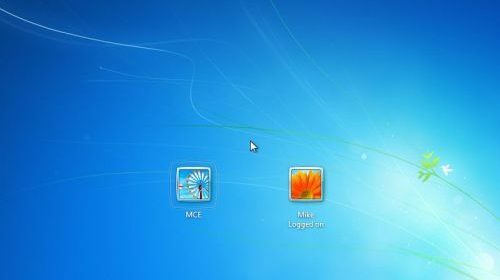 One of the most popular articles ever at MissingRemote.com has been our guide on how to enable Concurrent Sessions for Windows Vista.For those unaware of what it is, enabling Concurrent Sessions allows you to Remote Desktop into a system that someone else is on, under a different user account, and access the system without kicking the user off. I, for example, use the feature to have MCE running on my Television, and then I remote into my main user account to access all my files without interrupting my MCE session. Special thanks to Mikinho for compiling the package below and making this all possible. 1. First, Download the file attached below (you will need to be registered and logged in. If you executed the command successfully, you should see this screen. We hope you have enjoyed this guide from MissingRemote.com! If you have any questions, comments, concerns feel free to post in our forums link below. When I download this file windows tells me it is invalid, and empty. Thanks. You will need to edit the install.cmd file to work for your version of windows. I only had to change lines 2 and 4 and follow the instructions above and everything worked just fine. After putting in user/pass, it auto disconnects me. Says Windows closed connection. I copied and installed the file but it ran into some errors and now I can’t remote desktop into the system at all. RDP service throws an Error 126: The specific Module could not be found. I had been trying to get the Vista Home Premium hacks but the links seem to be dead or high jacked. Is the termsrv.dll and reg hacks available anywhere. dmv_023, if you were attempting to use this with a later version of SP1, like the current public build 721, why not just change the “SET SET_CSDBUILDNUMBER” line up top? I definitely don’t see why currentbuild needed to be changed, since that’s staying at 7601. Will I be able to login ( as a different user than the one logged in directly) on to a Windows 7 system remotely using UltraVNC ? Keeping my fingers crossed …..
Not working correctly for me. I can confirm that W7-SP1-Beta-RDP.zip works with the full public release (not beta) of Windows 7 Pro 32bit with Service Pack 1 integrated. This was released by Microsoft today on their volume licence site. It’s working for HP Probook 4525s. But need to download another version which is not for the beta version. Even though the script said it had patched successfully I had to manually copy across the termsrv.dll and it’s now working fine on 7 Pro x64 SP1 general release. I can confirm that the latest script work without any problems for both 32 and 64 – Swedish Win7 Home premium. Many thanks! “Your operating system is not supported. Only for Operating System Build 7601. Go to the following registry entry. You should be able to find the exact build , csbuild and version of your windows that you need to change in the installer. Will this require a reboot? Will this require a reboot? have changed the product name to “Windows 7 Professional” and csb build to 1130 which matches my regedit..
the install.cmd seems to run through fine but multiple rdp didn’t work. Ouch! Changed the SET SET_CSDBUILDNUMBER=”1130″ to match the registry and the script runs OK. However, the SP1 did not change over to allow multiple login. Still asks to disconnect other user. A look at the registry . . .
Well, any subsequent runs just say that it is already patched, and if so, that patch is not working…. The Remote Desktop Services UserMode Port Redirector service is stopping.. 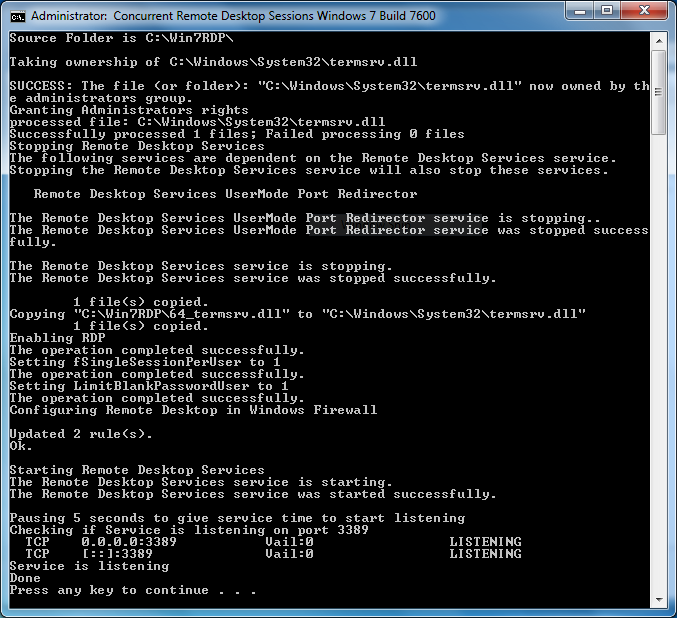 The Remote Desktop Services UserMode Port Redirector service was stopped successfully. The Remote Desktop Services service is stopping. The Remote Desktop Services service was stopped successfully. The Remote Desktop Services service is starting. The Remote Desktop Services service was started successfully. Ok, found the problem. It is for repeat users, who may have patched with the original, before SP1. In your system32 folder you will find a termsrv.dll.bak which is a copy of the original when you applied this once before. Rename termsrv.dll.bak to termsrv.dll.org or anything else different than the .bak extension. The script looks for it, I guess to determine if it was already patched. This is why I got that when I ran the script. After I renamed to .org, the script was run again and the patch applied itself and made a new termsrv.dll.bak of the SP1 version or termsrv.dll. Tried multiple login and it works fine. The only edit needed was the SET SET_CSDBUILDNUMBER=1130 one. This solved the problem for me, thanks EddoAloha. I’m guessing we are running the beta version of this dll though? How can I make my Win7 PC boot two sessions simultaneously? One session for the person at the PC, the other session running a program on boot for the remote user. I don’t want to have to RDP into the second session to start the program everytime. works great!!!! is this legal? my cpu use 100% now . . . .
my cpu use 100% now . . . . hmm…..
How many terminal/RDC sessions does this exactly enable? Need help enabling blank pasword. Followed instructions as above comes up as “install” not a valid comand. Help! want to be able to log in without password. I dont want to have another account enabled to be able to remote connect. I’m not getting this up and running unfortunatly. I have Window 7 Professional, SP1, 7601. The install goes smooth and I get the loginscreen when I try to connect, but when I have written the password and confirmed I get a message saying that the connection was lost. Does anyone have a clue what might be causing this? I also had to copy the termsrv.dll manually in safe mode to get this to work. Perfect now! Gents, when i run install script it gives me and error that my OS is not supported but im running exactly same version as is needed.. did i miss something or im doing something wrong ?? can it be that some latest patch from M$ is blocking this function somehow? Thanks to all!! It worked. Made the ” SET SET_CSDBUILDNUMBER=1130 ” edit that EddoAloha recommended & it ran fine. worst instructions ever. Doesn’t explain anything. Is this expected to work with Windows 7 Home Premium SP1 (which doesn’t support Remote Desktop to being with)? The reason I ask is because I installed this patch on my PC. Then I tried to use a second computer to connect to it. It seems to find the machine with any issue and understands the correct username/password. However, when the connection goes through, nothing happens. Reading Microsoft forums seems to suggest you have to enable Remote Desktop through the Remote Desktop options of the Control Panel. However, these options are not available in Home Premium because the feature doesn’t exist on this version of windows. Is this patch supposed to make those options available? Was anyone able to host remote desktop on Home Premium? works like a charm, thanks. What instructions do you need? Just download the files and run as Admin. That’s it! Works 100% on my version of windows. Kindly help me that is there any way to enable RDP in widows 7 starter….